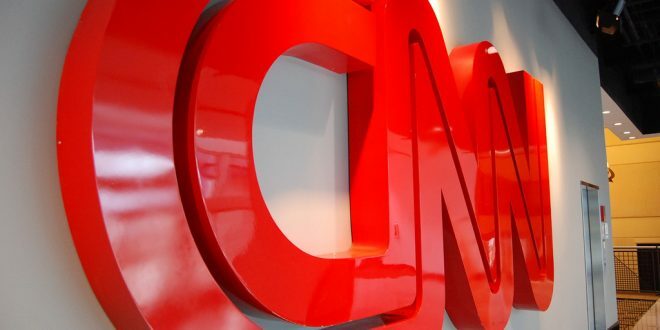 In an interview with Charlie Rose on the 10th of August 2016, CNN’s Middle East “super-correspondent”, Clarissa Ward, said that the Al-Qaeda-affiliated Japhat Al-Nosra (now known as Japhat Fatah Al-Sham) were the only ” heroes” in the mislabeled Syrian Civil War. 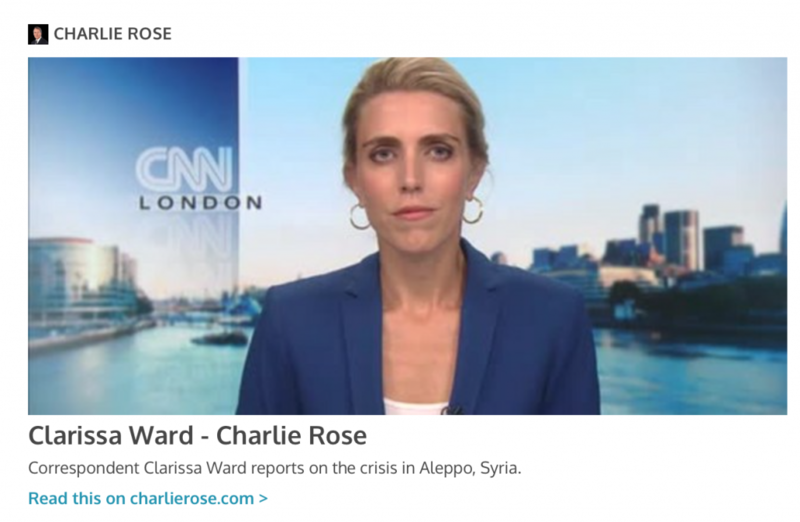 Ward told Charlie Rose, ” … even though some of these more extremist factions are not hugely popular with everyone living in rebel-held areas, they are also the people who have unfortunately, Charlie, emerged as the so-called heroes in this narrative because they are the ones who have stepped in to fill the void. This is not the first time a major Western broadcaster has publicly backed the terrorist group. Since Syria was invaded by foreign mercenaries in 2011, backed by U.S./NATO/Israel, with the objective of breaking up the country according to NATO’s geopolitical interests, the terrorist group are systematically described by the Western corporate press as ‘moderate rebels’. When asked if the Japhat Fatah al-Sham, have really severed their ties with Al-Qaeda, Ward states that it is unlikely as they praised Osama Bin Laden and Ayman Al-Zawahiri in their recent videos. But she still advocates US support for the terrorist group by describing the Lebanon’s Hezbollah who are supporting Assad as “terrorists”. According to that logic, if Assad is using “terrorists”, so should the U.S! Now, as the battle for Aleppo, Syria’s second largest city, heats up, the terrorists are again being marketed by their puppet-masters as ” heroes”. Hezbollah was formed in Lebanon after the Israeli invasion of that country after 1982. The organisation participates fully in the electoral, democratic process and respects the political rights of all Lebanese citizens. To therefore suggest that two law-abiding nation states and a mass democratic organisation of legitimate resistance to colonial rule, are the equivalent to head-choppers, rapists, marauders and mass murderers in the pay of the retrograde regimes such as Saudi Arabia, is another cogent reminder of the moral bankruptcy of the Western military alliance and its media disinformation agencies. www.flickr.com/photos/hyku, used under creative Commons, no changes were made to the image. The United States who created Al-Qaeda – a fact admitted by Hillary Clinton – are the puppet-masters of the death squads who have overrun Syria since March 2011. It is claimed that a ‘spontaneous uprising’ against an ‘undemocratic’ regime was met by brutal violence from the security forces. That was the big lie which launched the war on the country. The Syrian government did not repress peaceful protests. I visited Syria two weeks after the violence broke out in 2011. I had the opportunity of witnessing some protests in Karfanbel outside Damascus. The Syrian security forces behaved in an extremely professional and orderly manner. On March 15th in the town of Daraa in the South of the country, snipers opened fire killing several police and protesters. The snipers were in the pay of the Muslim Brotherhood- a terrorist organisation linked to the United States and Israel, Turkey and the Gulf dictatorships. The Western press made no effort to investigate the origin of the violence in Syria. The Syrian government was blamed for repressing ‘peaceful protesters’. Human rights organisations such as Amnesty International, Human Rights Watch and subsequently White Helmets, played a key role in the lies and disinformation which the terrorists used as cover for their slaughter of the innocents in Syria. Only the willingly blind and ignorant could view the U.S./NATO/Israeli role in the destruction of Syria uncritically. 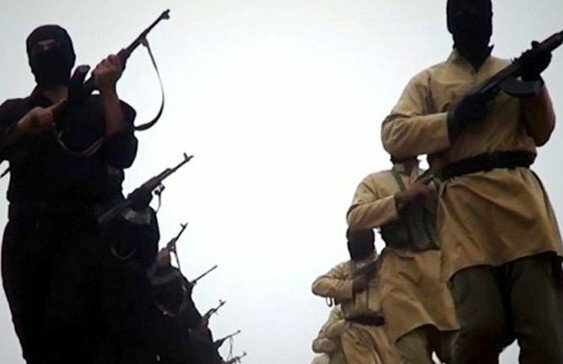 Since the arrival of IS (Islamic State, formerly ISIS/ISIL) on the Syrian war theatre in 2014, the intensity of the conflict has escalated. IS – another creation of the United States – was used by NATO as a pretext for a bombing campaign against Syria, when the lies and propaganda campaign against the country failed to provide the Western military alliance with the opportunity to launch a carpet bombing campaign against the Syrian state. The Western public are being told by corporate media giants like CNN et al, that their freedoms have to be curtailed in order to win the war on Islamist terrorists while the very same terrorists are being openly and unashamedly described as “heroes” when they commit atrocities in Syria. On September 11th every year the same news agencies will remind you about the “threat” of Al-Qaeda and the “heroes” fighting them. They will never tell you who those real heroes are; they are the men and women of Syria who are defending their country against the foreign invaders.They peacefully congregate en masse in public squares to wave the flag of the Syrian Arab Republic and the leader they believe to be an incorruptibly loyal patriot, Dr. Bashar al-Assad. Heroes are motivated by love, not hate.To understand why there is a catastrophic war in Syria, you just need to listen to what hateful people like Clarissa Ward say. And Clarissa Ward has told you that the Syrian rebels are terrorists and that terrorists become heroes when they serve U.S. interests.